If you’re obsessed with beauty products like me, you probably have way too many to fit into a regular makeup bag and it’s no doubt your stash is stored perfectly in acrylic drawers or some form of IKEA dressing table/cupboards. I have to say my makeup storage is set up exactly that and as much as I love it, I think it’s still important to have a daily makeup bag. They’re essential for travelling and I like to keep the products I use on a daily basis together to save me some time in the morning. I thought I’d share some of my top makeup bag picks with you in case you’re looking to upgrade your current one and aren’t sure where to start. 1. Alphabet Bags Natural Wash Bag. I was recently sent one of these Alphabet makeup bags and I've been using it every day since as I love it so much. First of all - who doesn't want to be greeted with the message 'you look lovely today' and secondly, its just the perfect size to squeeze all of my most used makeup into to. I also love that its made from a natural canvas here in the UK and it has a waterproof lining to keep in clean. I think this is my favourite of the whole bunch! 2. ASOS Large Oval Makeup Bag. If its a cheap and cheerful makeup bag you're after - you can't go wrong with ASOS. They have a lovely rang of affordable makeup/wash bags and I particularly love this bright Orange one. It would bring a ray of sunshine to any dressing table! 3. Ted Baker Small Bow Wash Bag. I think these are pretty classic makeup bags and lots of bloggers seem to have them, myself included. I got one as a gift last Christmas and I'm completely in love with it. It fits a LOT of makeup it in (seriously, its like Mary Poppin's bag), its easy to keep clean and its so damn cute. I love the contrast between the pale pink and black bow - it looks so pretty sat on my dressing table. 4. Kate Spade New York Carlisle Street Small Annabella. I had to include this one even if it is a little bit more pricey as I'm a tad obsessed with all things Kate Spade at the moment. Everything from the phone cases to the handbags and makeup bags are super pretty and if I had some spare cash (which is a rarity), I'd be treating myself to the whole range of KS accessories! This polka dot makeup bag with the iconic gold spade harware is just too cute but for £75, its currently a touch out of my price range! 5. Vendula Penny-Farthings Cosmetic Bag. I was recently introduced to the brand Vendula and after having a little look through their website, I fell in love with this makeup bag. Everything from the soft neutral leather to the oval shape and scenic print is just perfect. The penny farthings print is so pretty and every time I look at it is reminds me of warm Summer nights walking through picturesque cobbled streets in a floaty Summer dress. 6. Happy Jackson Lovely Things Wash Bag. Since receiving a Happy Jackson notebook for my birthday, I've become a little bit obsessed with the brand. I love that they do a range of quirky bits and pieces including notebooks, mugs, lunch boxes and these cute makeup bags. I particularly love the one above because of the 'Lovely Things' print and the fact its made from a patent leather - easy to keep clean! So there we have it - some pretty makeup bags that are perfect for storing the daily face stash! Which is your favourite? Can your recommend any others? **Collaboration with Vendula. All opinions are my own. I have quite a collection of make-up bags (despite having my make-up stored in drawers.. but still) but I'm definitely going to have to try and get my hands on the first one, it's adorable! I love the Etude House Feel The World makeup bags, as they are so adorable! I am lusting after a grey Smythson makeup bag though, but they are eye-wateringly expensive -.- Maybe one day! I love pretty make-up bags at the moment, I'm building up quite a collection! I have a massive liberty one for when I'm travelling because 'pack light' is not in my vocabulary and a smaller one for little trips but I don't have one for everyday! I normally just shove things in my bag but the Vendula one is calling to me to change my mind.. I love bags 1 and 3! :) I have the larger Ted Baker one! I love Happy Jackson all of their products are so fun! Also love the ASOS make up bag, gorgeous colour! These bags are too cute. I really love the Alphabet bag - and the fact that it's wipe-clean material inside makes it even better! I feel like I really need to invest in a little bag, it's so annoying when your make up is flying all over the place in your hand bag! love all the make up bags :) I kinda want all of them! I feel like I am a horder of make up bags! I have so many and barely even use them but they are all so pretty haha! Love the Ted Baker one, so cute! They are all so cute! I want them all! 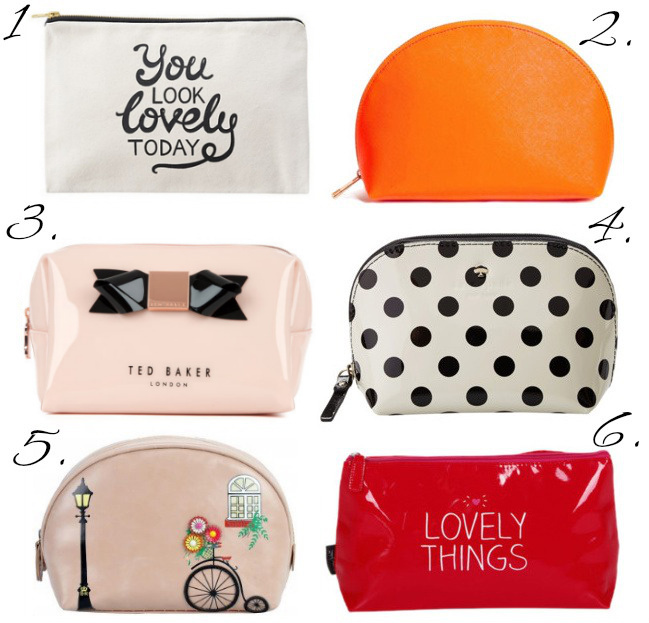 I'm a makeup bag junkie, love a few of these especially the Ted Baker and Alphabet bag one. Most of mine are Disney one and from Primark, I love a bargain and as I only use them when going away I've never felt the need to pay too much for one. I'm a big fan of Vendula London, I love their bags! These little bags are too cute!! I'm so into bags with fun little quotes on them! I have the Ted Baker bag in mint green! Really enjoying it so far, especially how easy the outside is to clean - my old cosmetic bags would get so gross looking. I have far too many makeup bags already, but these are lovely! Totally agree with you with the Ted Baker bags. They're great and I don't know many people without one! haha. I love the Penny-Farthings bag, what a lovely design. I must resist buying one, I have so many cosmetics bags already, and I don't even use most of them! I have the Alphabet bag- it's such good quality, I love it! I love make-up bags, not sure I need more but they're so addictive to collect!